The Perfect Accord by Antoine Watteau, Part 2 of the Introduction to Art and Artists of Our Time. 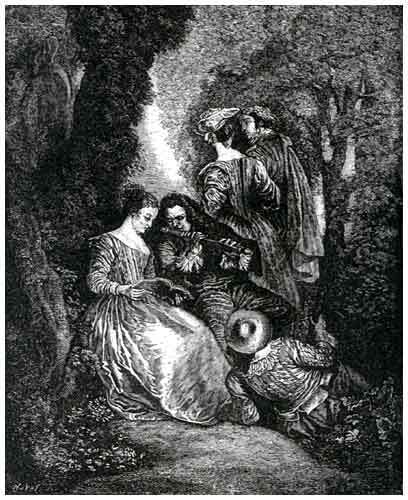 From the painting by Antoine Watteau. ANTOINE WATTEAU, the first name of real importance after those of Nicolas Poussin, 1594-1665, and Claude, 1600-1682, was born at Valenciennes in 1684, two years after the death of Claude. He was the son of a master-tiler, and his father was naturally disinclined to aid him in his project of becoming a painter; but he gave him the beginnings of an education in the art, such as it was possible at that time to obtain in a place like Valenciennes. Watteau early left his home for Paris, and there for a time supported life as he might, working at the drudgery of copying religious pictures for the keepers of booths on the parvis of Notre Dame. He had a natural talent, shown from the first, and he soon made his way out into the world. He became acquainted with Gillot, a painter of fashionable frivolities, drinking-parties, gallantries, and even historical subjects, but who was at this time engaged upon subjects drawn from the plays then in vogue at La Comedie Italienne - the chief theatre of the day. This acquaintance decided Watteau's taste, and he entered with ardor upon a field that he was destined to make his own as against all comers. The circumstances of his after life are of no particular interest; he continued to paint the same sort of subjects to the end, and he made no attempt to enlarge the horizon of his art. He was not a person of a very solid character; he was easily the dupe of designing people, and made too light of his own work to achieve fortune. His health too was poor, ruined by early struggles and deprivations, and his later years were broken by the struggles made necessary by the care of his health and the difficulty of earning his bread. He made a brief visit to England, the climate having been recommended to him, and he had hopes, beside, that he might mend his fortunes there. But the coal-smoke and the rain combined with his bad health to drive him back to Paris. M. Crozat the younger, a liberal and kind-hearted amateur, offered him a home, and he lived for some time with this gentleman, where he enjoyed the opportunity of seeing daily, and studying, the many fine works of art with which the house of that distinguished collector was filled. But Watteau was plagued with a spirit of unrest; he could not stop long in any one place, his bad health made society irksome to him; he was easily tired of his friends, and yet his friends clung to him, for his character seems to have endeared him to those who know him. One of these friends, learning that the air of the country had been recommended to him, offered him a house at Nogent, near Vincennes, and Watteau removed there; but he longed to return to his native Valenciennes, and would have done so, but death interposed, and took him away in 1721, in the thirty-seventh year of his age.